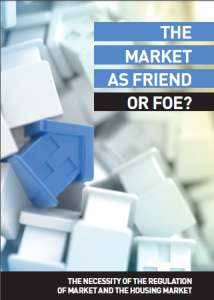 Alliances to fight poverty › The market: friend or foe? This report of the seminar of the Alliances to Fight Poverty at Marseille will analyse the regulation mechanisms for the economy and social sectors. Market regulation proposals tend to be inspired by privatization and deregulation practices of the financial sector. Regulation is about excluding bad practices. But we have to wonder: when we speak about regulation, are we talking about the market or about bad practices? What kind of market are we talking about? The market, a social conquest ?! Markets and Resilience: a contradiction or a potential? How can we democratise our economic system? How can social services work with the market? Housing, welfare and the market: an impossible combination? The Housing Market – the necessity of regulation?